Harrison Richards can inject a little bit of real magic into your wedding reception by performing his unique brand of close-up mind magic during your big day. Wedding reception entertainment from a mind magician is a great way of creating a bond between two families and breaking the ice whilst your guests are socialising during the photos, or waiting to be seated. I have been performing magic for over 20 years. Specialising in close-up magic, after dinner cabaret and balloon modelling. 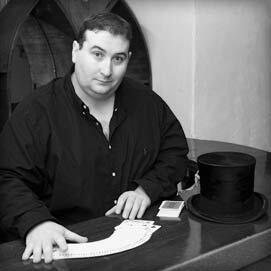 I am a Member of the Magic Circle (MMC), The York Society of Magicians and Equity. The events I have performed at range from corporate product launches, weddings and anniversaries, 4th birthdays to 100th birthdays and Theme and party nights. Even Hen nights! The venues are even more diverse from church halls to 5 star hotels, restaurants, pubs, clubs, theme parks and private dwellings. Any party, occasion, venue or theme you can imagine..
Mark Waddington is undoubtedly one of the most sought after Magicians within the UK. With several years of professional working experience under his belt, you know you are on to a safe bet booking him! Brides and grooms, corporate bosses and many others ask for Mark by name, because they know he will entertain guests in a unique fashion and create long lasting memories for guests and clients. He isn’t one of those cheesy sorts of magicians you so often see. He doesn’t dress in ties or braces covered in playing cards, he doesn’t wander around wearing a jacket covered in pin badges of little white rabbits sat in top hats. He doesn’t walk around with a sparkly magic wand in his pocket. Magic often has a bad name because of this stereotype, but Mark is here to break the mould. He dresses in a sharp and sophisticated style, which will make you sit back and realise that magic has been reborn! As a close up Magician, Mark Waddington will approach your guests in a friendly but unobtrusive fashion, and within minutes he will have them screaming with bewilderment and laughter at the micro miracles he performs inches from their faces. Many of Mark’s repeat clients knew they were on to a safe bet with him – not necessarily because they could see the tricks he can do, but because they heard the response he gets and can feel the atmosphere he creates in any room he walks in to. Most often, Mark is asked to perform as a table magician at weddings. He works at around 50 weddings per year, so knows exactly how to do it right. The most important thing about the wedding day is the bride and groom, and he knows this, so he won’t try to steal the limelight, but he will help to make it the most memorable day for the guests and the happy couple. Knowing that weddings rarely run to schedule, he can help to disguise any little hiccups that may occur and will use his experience to break the ice for guests who may not have met each other before, making the rest of the day a lot easier to handle for guests and the newlyweds alike. 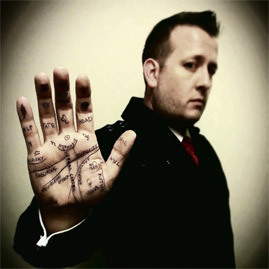 Mark is also a regular on the corporate scene performing his mind-blowing miracles as a close up magician. From groups of a dozen to hundreds of guests at a banquet or award ceremony, Mark can adapt his performance skills to give you the best value for money, and the best entertainment available around. Your delegates will remember the night for years to come, and your distinguished guests and shareholders will know you only operate with quality, which will shine through with Mark’s performance. Mark’s corporate clients include such names as Tesco, Cable and Wireless, Tri-pack Plastics, Cool Milk Ltd and many, many more. They all have something in common. They all came to Mark with a clear objective – to obtain the very best entertainment possible, and to prove to their guests that they are the best, through and through. Your company can and will benefit from using Mark as a Mix and Mingle Magician at your next corporate event, no matter how big or small. However, Mark isn’t just a close up Magician. 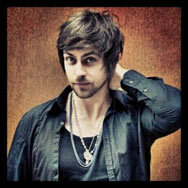 He is also a highly entertaining and hugely funny stand up magic act. With shows ranging from 15 minutes to 50 minutes, Mark will have them rolling in the aisles, regardless of audience size! Mark has performed his stand up act to 20 people in a meeting room, ranging up to several hundred people in a theatre auditorium. No matter what venue or show, Mark is suited as the perfect magic act. Regardless of what event you are trying to organize, Mark is the ideal choice to add something that little bit different. From product launches to parties, from weddings to Works Christmas do’s, by hiring Mark, you will have people remember the date for years to come. Despite the fact that I was christened David Mark Reid-Frow I'm know by the performing name of Uncle Brian, the children's entertainer who is legendary for being the life of the party, in contrast to some cabaret stand-up comedians, Uncle Brian does not make fun of the audience, so has shows suitable for all ages from tiny tots to teenagers. David Reid-Frow, the multi-talented professional performer who's performance skills are so diverse they are listed here alphabetically making child's play out of the one stop shopping selection for your own combination of kid's entertainment producing a perfect party package, covers the UK with 30 years experience from entertaining children as far north as a roadshow disco in Fraserburgh Aberdeenshire, as far south as Punch and Judy in Brighton Sussex and thousands of venues in between for reasonable prices. However, the children's entertainer is able to provide a great deal in addition to the children's birthday packed with party dances and musical games of the funky fun disco. Any time kids need entertaining, the children's entertainer has the perfect package that's bang on for your big bash - from anniversary to balloon workshop, from christening to dinner dance, from educational show to festival, from graduation ball to hullabaloo, from inauguration to juggling workshop, from karaoke to launch, from meeting to night out, from one on one to powwow, from quiz night to rendezvous, from shindig to turnout, from union to variety, from weddings and Xmas to anything beginning with Z. Children's parties, school shows and event entertainment - Magic Puppet Theatre makes any event an unforgettable experience. Breathtaking magic and illusions, entertaining and mischievous puppetry guaranteed to get everyone laughing. Magic for all occasions. Children's entertainment includes magic and juggling shows for all ages including balloon modelling. For adults and corporate, close up is ideal. A family stage show, with large magic and illusions. With comedy and live animals.